I wanted something to go with the leftover grilled steak and chicken I brought home from a family barbecue the other night and this delicious brown rice salad with chickpeas, green chiles, tomatoes, cilantro, and a cumin and lime vinaigrette really fit the bill. Although this was just a quick lunch I threw together from what I could find in my fridge and pantry, it was delicious and I would definitely make it again. 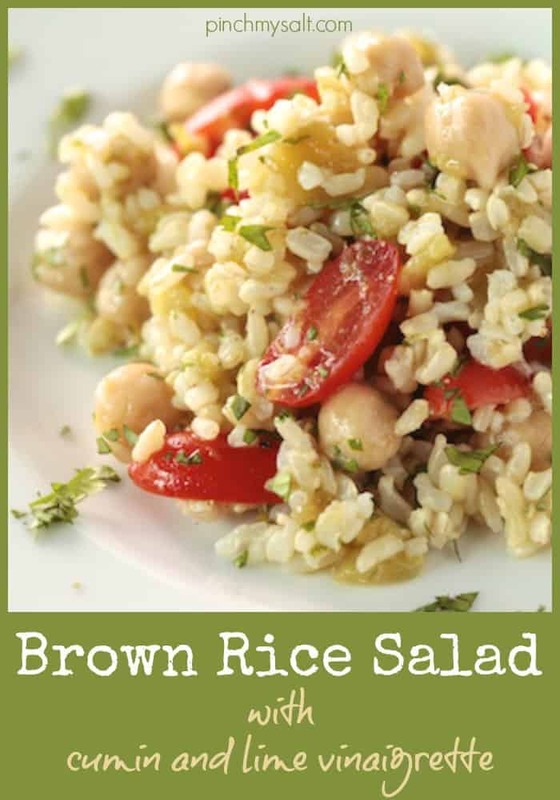 This brown rice salad recipe works well as either a side dish or a light vegetarian main course for lunch. Top it with thinly sliced grilled chicken, steak, or tempeh and you have a hearty and delicious summer meal. Feel free to play with ingredient amounts to suit your own taste. I think it would be great topped with some sliced avocado and roasted pepitas. A sprinkle of queso fresco or Cotija cheese would be great as well. Put garlic clove and salt in a small bowl and mash them together with a fork to form a paste. Add lime juice, zest, and cumin. Whisk lime juice mixture together then slowly whisk in the olive oil. Taste, adjust salt as needed; set aside. 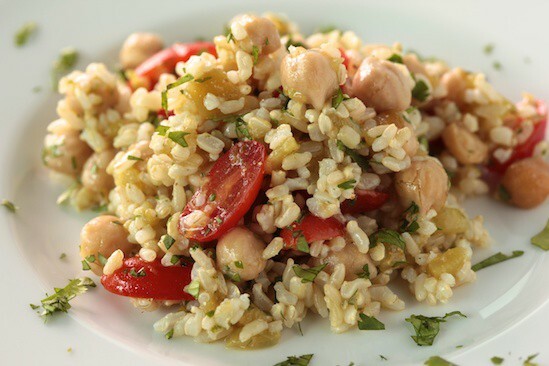 In a medium bowl, combine brown rice, garbanzo beans, chopped green chiles, tomatoes, and cilantro. Add dressing and toss gently to combine. Can be served immediately. If made ahead and refrigerated, allow to sit at room temperature for 30 minutes before serving. *Cumin is much more flavorful if you start with whole seeds, toast them, then grind them yourself. I toasted one teaspoon of whole cumin seeds in a dry skillet just until fragrant then ground them into a powder using a clean coffee grinder. Roasted pepitas would be a good addition. I'm with Kalyn--cumin and lime sound like the perfect seasoning for this salad! You've made my rice salad creativity wheels turn with this one! Ingredients like black forbidden rice, cranberry beans, cucumber, serrano peppers, perfect fresh nectarines, bay scallops... not all together of course, but each could provide a yummy riff on your theme.Thank you! Cumin and lime belong together. This sounds like the perfect lunchtime salad. I've been on a serious lunch salad kick and can't wait to give this a try! This is my perfect lunch! I always bring a little side of brown rice to work with my raw veggies for lunch, but this looks much more interesting! Thanks for sharing my new favorite lunch! I love all those ingredients. Sounds so good! This looks amazing! I love these kinds of salads. I'm making this today and plan to share on my blog this week. Thanks! Looks and sounds delicious. I've been trying to eat less meat and this just might be able to suffice for an entrée in our house. Thanks! I just finished making this salad and it is delicious! I forgot to pick up green chiles so I added a touch of cayenne pepper and chopped up some red onion to break up the flavor a little bit! It's chilling in the fridge right now but think I might cut up some avacado to add to it as well! This might end up being a work lunch staple for me! Thanks for sharing! I've already done this twice since you posted it! It was tasty and healthy! Couldn't find chiles so i used green & yellow peppers. It was beautiful! Thanks!